This is always one of my favorite blog post to write because I basically get to online shop without the actual shopping part. I basically just add a ton of stuff to my wish list on my Pinterest board and send the link to my friends. Basically making me the easiest person to shop for. 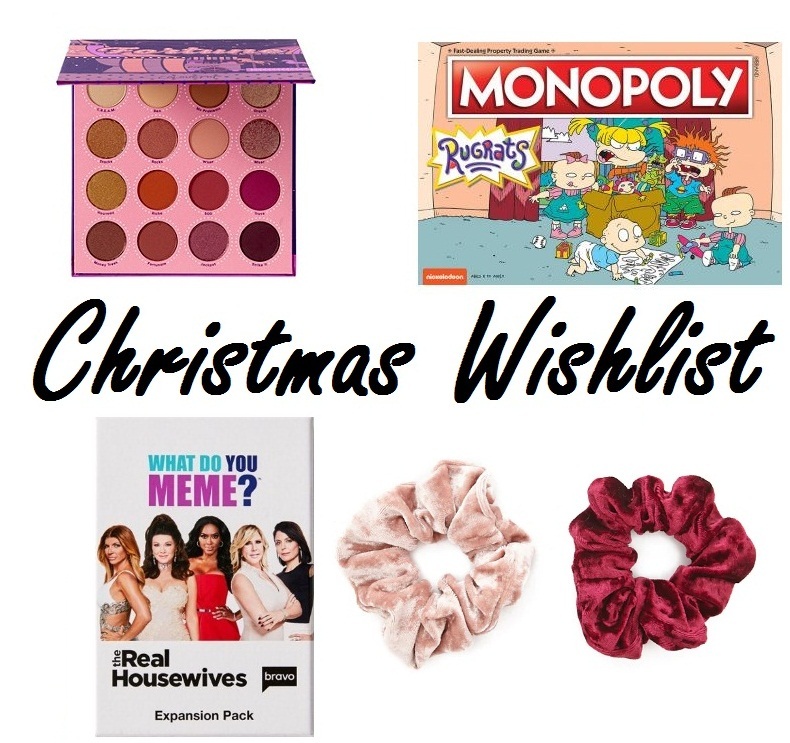 Here is my Christmas Wishlist this year! Gold Jewelry // I love gold jewelry, it makes the perfect accessory for just about everything. Some of my favorite pieces have been chunky gold hoops, this lightning bolt necklace, stud earrings and a block monogram necklace. Eyeshadow Palettes // There have been a ton of eyeshadow palettes that have come out recently that I can't stop obsessing over. Literally too many to count so I'm just going to list them here: Too Faced Gingerbread Spice, Huda Beauty Amethyst Obsessions, Huda Beauty Ruby Obsessions, Colour Pop SHE, Colour Pop Yes, Please!, Colour Pop Fortune, Colour Pop Ooh La La!, Colour Pop LIT, Morphe 35F, Morphe Bling Boss, Kylie Cosmetics Burgundy Extended, Kylie Cosmetics Peach Extended, Kylie Cosmetics Birthday 2018, Kylie Cosmetics Purple. Makeup // Aside from the million eyeshadow palettes I've been drooling over there are a few other makeup products that have caught my eye. Like the Kylie Cosmetics Birthday Highlight, Colour Pop Stop It Blush, Britney Spear Curious Perfume, Nip + Fab Dragon's Blood Serum, Olly Gummy Vitamins (pretty much every type available), Aztec Healing Clay, Benefit Cosmetics Brow Contour Pencil, Benefits Cosmetics Eyebrow Primer, Morphe Blending Brush, Sapphire Beauty Blender, Transparent Makeup Bag, Kylie Cosmetics Todd Cranes Lip Kit, Kylie Cosmetics Bite Me Lip Kit, Kylie Cosmetics Boujee Lip Kit, Crushed Velvet Scrunchies, Morphe Pointed Blender Brush. Home Decor // Having your own place can be really fun. Especially as your style starts to evolve. There are some really cute home pieces that I have been eyeing and those are; Glamorous Wash Diva Scent Laundry Detergent, Macbook Pro, Wireless Charger, Ugh Neon Sign, Benefit Gorgeous Travel Vanity, Nightmare Before Christmas Cookie Jar, Tabletop Fireplace, Can't Adult Today Candle, Breakfast at Tiffany's Quote Pillow. Books, Movies & Games // Not only do these make great gifts for just about anyone, but I definitely have some of these on my wishlist! Ariana Grande Sweetner Vinyl, ELF Motion Soundtrack Vinyl, Michael Buble Christmas Vinyl, What Do You Meme: Real Housewives Addition, Britney Spears Baby One More Time Vinyl, Best of Nickelodeon Vinyl, Buenos Nachos Cookbook, The Office Monopoly, The Actor's Life by Jenna Fischer, Barbie Style, Gossip Girl Book Set, Vampire Diaries Book Set, Archie Puzzle, Riverdale Monopoly, The Office Clue, Rugrats Monopoly, A Simple Favor Book, Simpsons Monopoly, The Nightmare Before Christmas Yahtzee, The Nightmare Before Christmas Operation. Clothes // Some staple pieces that I want to add to my closet are a Teddy Coat, White Vince Slip-On Sneakers, Chloe Cuff Shorts, Kelly Shirt, Raleigh Roll Up Shorts, Adidas Originals Tubular Shoes, Mother of Dragons Crewneck Sweater, Vogue T-Shirt, Benefit Gorgeous Spinner Suitcase, Benefit Gorgeous Duffel Bag, Patagonia Pullover.